More than 20 years, many world tours, and millions of records later, and with the blessing of the band, Rhino/Atlantic Records has released I'm Only Looking, the definitive video collection of INXS hits spanning their entire career. A 2-DVD set, I'm Only Looking is packed with music videos and exclusive bonus material. In 1997, the death of singer Michael Hutchence seemed to signal the end of Australian rock band INXS. However, seven years later, they’ve been resurrected in the method of the moment: as a reality show. A program will follow the surviving members as they search for a new singer to take Hutchence’s place. I think that’s a mistake, and one that smacks of some desperation on the part of the remaining INXS boys, but it’s their prerogative. In the meantime, fans can revel in the band’s glory days via a new compilation called I’m Only Looking: The Best of INXS. 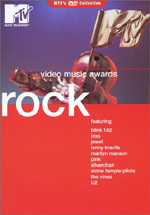 This two-DVD set includes 25 music videos on the first platter and many other components on the second disc. I’ll address the latter when I get to the supplements, as I considered DVD One to comprise the main feature here. The 25 videos span a period from 1980’s INXS to 1997’s Elegantly Wasted and all come with introductions from surviving band members. We hear remarks from saxophonist/guitarist Kirk Pengilly, guitarist Tim Farriss, drummer Jon Farriss, keyboardist/guitarist Andrew Farriss and bassist Garry Gary Beers. The intros also present text information that details the dates for each video, the albums from which the songs came, their directors, and their filming locations. From 1980’s INXS we get one song: “Just Keep Walking”. No videos from 1981’s Underneath the Colours appear, but we find two numbers from 1982s Shabooh Shoobah via “The One Thing” and “Don’t Change”. Another single song emerges from 1984’s The Swing with “Original Sin”, arguably the band’s first hit. Their first big album - 1985’s Listen Like Thieves presents four numbers. It offers probably the group’s initial “signature” song with “What You Need” plus “This Time”, “Kiss the Dirt (Falling Down the Mountain)”, and the title tune. While Thieves proved to be a success, 1987’s Kick turned INXS into the rock elite. The DVD presents a whopping five videos from that album: “Need You Tonight”/”Mediate”, “Devil Inside”, “Never Tear Us Apart”, “New Sensation” and “Mystify”. Four more videos come from the 1990 follow-up called X: “Suicide Blonde”, “Disappear”, “Bitter Tears”, and “By My Side”. 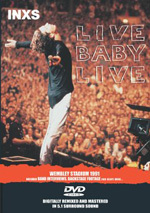 The 1991 concert album Live Baby Live offers one new studio song with “Shining Star”. To round out the collection, another four videos emanate from 1992’s Welcome to Wherever You Are. We find “Not Enough Time”, “Taste It”, “Baby Don’t Cry” and “Beautiful Girl”. Only one number each appears from the band’s final two albums. 1993’s Full Moon, Dirty Hearts gives us “The Gift”, while 1997’s swansong Elegantly Wasted provides the title track. If I learned one thing as I watched Looking it’s that long video compilations shouldn’t be viewed all in one sitting. Unlike the almost three and a half hours of The Best of Bowie, however, this set felt manageable at less than two hours. I guess it was manageable, but I couldn’t help but think some video fatigue started to creep in after a while. Much of the reason I feel that way stems from the fact that I enjoyed the videos and music from the first half or so more than I did from the second half. My impressions for the videos from X through Wasted tended to be noticeably more critical, and I simply didn’t enjoy them as much. However, this might not solely reflect weariness. I think that by 1990, INXS started to falter as a creative unit. Not everything they did through Kick was great, but with X, they began to border on self-parody. The tunes featured here from that album often came across as retreads of earlier - and better - numbers. “Suicide Blonde” presented a self-conscious attempt to recapture the hit sound of Kick, and I heard “Bitter Tears” as little more than “What You Need Pt. 2”. Granted, many bands self-plagiarize, but they do so better than INXS did. This meant that most of the songs from 1990 and later left me cold. “Elegantly Wasted” had a nicely funky kick to it, while “Disappear” was catchy. Otherwise, I find it hard to remember much about the material from the Nineties. The videos didn’t stand out too well either. “Not Enough Time” featured a memorably hot woman in a crocheted dress, but I’d be hard-pressed to point out anything else about it. “Taste It” presented a surreal and quirky look into the INXS neighborhood that made it easily the best of the Nineties bunch; I don’t recall much about the song, but the video’s quite entertaining. Otherwise, that era seemed less than fascinating. Often the band simply tried too hard. “Beautiful Girl” wanted desperately to make a grand statement about the pressures women feel to remain thin, while “The Gift” batters us with aggressive and violent images. “Disappear” feels like a sequel to Madonna’s vogue. All of this leads me back to the Eighties, an era in which INXS did much better for themselves. Actually, I can’t claim that the videos from those years are all that much stronger, and technically, they might be crummier. Indeed, the earliest clips looked pretty primitive and silly. “The One Thing” is especially laughable with its over the top use of sexual imagery in food. Nonetheless, old videos like this have a quaint charm that makes them fun to watch; they stink but they’re so naïve that they’re entertaining. “What You Need” provided the band’s first truly effective video that still fared well. It used a choppy cut-up photo montage look that mostly used stills linked together to create an impression of movement. Stylized and effective, this remained an excellent video, and the song seemed terrific too. The Kick videos probably were the best of the bunch. Although Hollywood director Joel Schumacher helmed “Devil Inside”, it was the weakest of the bunch. One of the most “Eighties” of the bunch, it just had us watch an absurdly thin video vixen with huge hair - a staple of the era - as she shimmies and the band emotes. Much more creative, “Need You Tonight”/”Mediate” started with a creative montage approach and then developed into an homage to Dylan’s “Subterranean Homesick Blues”. This made it creative and involving. “New Sensation” basically stuck with the standard lip-synch performance vibe, but this suited the song - my favorite from INXS - and worked well. While the videos of this era seemed superior to those from the Nineties, mainly it was the higher quality of music that made the earlier numbers more endearing. “Just Keep Walking” found a band searching for an identity, as it sounded like standard-issue New Wave piffle. “The One Thing” showed their development toward their signature sound, however, and presented a strong tune, as did “Don’t Change”, even though the latter sounded somewhat like Rod Stewart’s “Young Turks”. As noted earlier, “Original Sin” stood out as the band’s first well-known number and remained a fine song, and “What You Need” clicked. Funnily enough, I didn’t like INXS much back in the Eighties. I always felt I should, since they represented a genre I usually enjoyed, but beyond “New Sensation”, they failed to connect with me. Surprisingly, I enjoyed much of the Kick material in addition to the still-excellent “Sensation”. There was a good reason Kick made the band so popular. While I felt the music and videos got worse as the years passed, one consistently fun element of Looking stemmed from the band introductions. Even without the comments from INXS, these presented some nice information. The text material helped let us know the basics about the songs and videos, while the band members fleshed out the tracks. The quality of the stories varied quite a lot, as some of them provided only the most rudimentary thoughts. However, most of them offered useful notes, and some included very amusing and intriguing comments such as the Godley and Creme tale for “This Time”. We rarely find band involvement with compilations of music videos, so the remarks featured here were a nice component. Although I thought the songs and videos demonstrated erratic quality, this was inevitable, and most of the material came across as good. Many of the weaker numbers weren’t really bad, but they just didn’t match up with the stronger tunes. As a package, I can’t fault much about I’m Only Looking, for it seemed like a thoughtful and well-considered compilation. 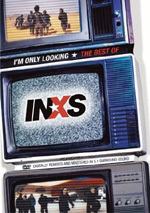 I’m Only Looking: The Best of INXS appears in an aspect ratio of 1.33:1 on this single-sided, double-layered DVD; due to those dimensions, the image has not been enhanced for 16X9 televisions. Given that these videos cover a span of 17 years, one might expect widely varied picture quality, and that was what I found. However, within those restrictions, I felt the videos generally looked quite good. For the most part, sharpness seemed adequate. Some of the clips came across as mildly soft or fuzzy, but these usually problems stemmed from some less-than-stellar material used for the originals. When the source was up to snuff - more prevalent during the newest videos, but never consistent - the shots seemed crisper and more detailed. Moiré effects and jagged edges presented slim concerns, and I noticed only light edge enhancement at times. Source flaws most heavily affected the oldest clips. The first handful demonstrated all sorts of specks, marks, hairs and other defects. However, once we got to Listen Like Thieves, matters cleaned up considerably. Most subsequent issues stemmed from intentional “defects” like the heavy grain seen in “Bitter Tears”. The package represented the videos fairly cleanly. Colors usually appeared fairly decent but erratic. At times, the hues looked a bit murky and runny. Other videos came across more effectively, though, and the colors mostly seemed reasonably vivid and distinctive. Some videos showed dense and dull blacks, but these appeared solid for the most part, and shadows also were occasionally problematic but generally well rendered. Given my experiences with older music videos, I felt that the INXS clips generally looked solid. Few concerns affected the positive audio of I’m Only Looking. The DVD offered both Dolby Digital 5.1 and DTS 5.1 soundtracks. I found the pair to sound identical, as I discerned no substantial differences between the two. While these multichannel mixes didn’t go nuts, they definitely added a sense of space that made them effective. Appropriately, the forward speakers always dominated, but the surrounds gave the music a feeling of airiness. Instrumental delineation seemed very clean and concise, and the audio still blended together well. The surrounds occasionally tossed in some unique elements like guitar fills or keyboards and they created a good atmosphere. These five-channel mixes seemed tasteful and worked nicely. For all the tracks, audio quality seemed generally positive. The music presented clean and clear highs, and vocals always sounded natural and distinct. Drums popped as they should, and guitars fills rang appropriately. Bass response appeared somewhat less than stellar. The track failed to use the LFE channel at all for music, so low-end restricted itself to the main speakers. This meant bass seemed acceptable but not especially rich. The lower end of the register didn’t make itself known, as the mix sounded slightly sterile and without great depth. Don’t get me wrong - the audio offered acceptable bass. However, those elements came across as more restricted than I’d like, which left this otherwise excellent soundtrack with a “B+”. As I alluded in the body of my review, I found it tough to differentiate between the “main” program and the “extras” of Looking. Technically one could consider everything to be the “main” part, but this was unclear, so I regarded the videos as the prime attraction and the other materials as the bonus pieces. It helped that all of those showed up on DVD Two, so there was a clear split. When we head to that platter, we start with INXS Live (1980-1997). This domain contains performances of “Simple Simon” (Australia, 1980), “Original Sin” (Australia, 1984), “Listen Like Thieves” (Australia, 1985), “Kick” (California, 1988), “New Sensation” (London, 1991), “Need Your Tonight” and “Mediate” (Japan, 1994), “Searching” (Australia, 1996), “Elegantly Wasted” (Colorado, 1997) and “Don’t Change” (montage, 1983-1997). When viewed via the “Play All” option, these clips fill 49 minutes and 10 seconds. This collection offers a solid look at the band on stage through the years. Of the bunch, the Japanese clips seem the strongest, largely due to the setting and unusual instrumentation. The “Don’t Change” montage also works well, as it blends together much better than most. In addition to the music, the “Live” segments present interview snippets with the band members. They add some nice details. Re-Mixed presents four alternate versions of songs. We get “Suicide Blonde” (Oakenfold 12” Remix), “The Stairs” (7” Single Mix), “Bitter Tears” (Lorimer 12” Remix), and “Disappear” (Morales 12” Remix). This area uses 25 minutes and 18 seconds. It takes the remixed tunes and matches them with live shots and pieces of the original music videos. None of the videos work terribly well, as they seem like the odd and ends compilations they are. However, the remixes sound good. They expand the originals nicely in creative ways. Next we 16-minute and 36-second documentary Welcome to Wherever You Are. This gives us glimpses of a massive charity show INXS organized in 1992, and we see parts of the concert as well as warm-up performances and rehearsals. That sounds good but doesn’t add up to much. The clips are short and jerky and don’t let us get a nice feel for the material. It’s an interesting historical curiosity and no more. We go to 1993 for the next element, Pictures from a Full Moon. This 12-minute and six-second section presents four videos created for a full video album related to the Pictures album. We find “Time”, “Make Your Peace”, “I’m Only Looking” and “Please (You Got That)”. I didn’t expect much from these, but they turned out to be good clips. “Peace” worked especially well, as it offered a cool mini-movie. Five more videos show up in Rare and Unreleased. 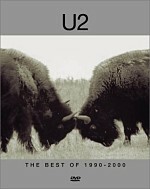 This collection runs 19 minutes and 18 seconds as it mostly features material from the band’s final years. For instance, “Don’t Lose Your Head” comes from the Face/Off soundtrack and includes some snippets from the movie. The most interesting piece is the earliest, though, as we get a rendition of “The One Thing” from 1983’s US Festival. Behind the Scenes runs includes information about INXS videos. In the 20-minute and two-second program, we hear from the band as well as former manager Chris Murphy and directors Richard Lowenstein and Troy Davies. They give us many nice notes about the specific videos and general issues in this informative piece. Finally, a Photo Gallery presents a running collection of pictures. It takes five minutes and 12 seconds as we watch the band through the years. It’s a fairly good collection. The same goes for I’m Only Looking: The Best of INXS. As with most music video packages, it presents peaks and valleys, but the overall level of quality is positive. The DVD offers erratic but generally fine picture with very good audio and a stellar set of supplements. INXS fans will love Looking and neophytes should give it a peek as a nice way to learn about the band.